Liberal South Korean President Moon Jae-In ran on a platform that emphasized reaching out to North Korea for peace talks. Moon’s hopes were quickly dashed by North Korea’s escalating nuclear and missile tests, and his leftist government is in trouble with its base for providing enthusiastic lip service to the hard line response to the threat from U.S. President Donald Trump and Japanese Prime Minister Shinzo Abe. Now the South Korean leader is said to view the upcoming Winter Olympic Games as a new opportunity to reach out to Pyongyang. Seoul welcomed a Jan. 1 proposal by North Korean leader Kim Jong-Un to send a delegation to the games. 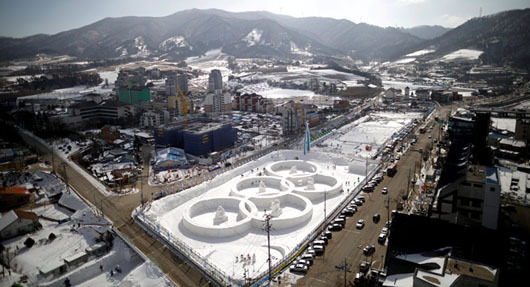 Seoul will host the Winter Olympics in PyeongChang from Feb. 9-25. “We welcome that Kim expressed willingness to send a delegation and proposed talks as he acknowledged the need for improvement in inter-Korean ties,” South Korean presidential office spokesman Park Soo-Hyun told a press briefing. In a televised message on Jan. 1, Kim Jong-Un said he may send a delegation to the games and is open to talks with the South. But he also made it clear that Pyongyang would not give up its nuclear and missile programs, and he claimed that a “nuclear button” is always on his desk. Lee Hee-Beom, head of the organizing committee for PyeongChang 2018, said it was “a positive sign” that North Korea had showed its willingness to take part in the first Winter Games to take place in South Korea. North Korea had a figure skating pairs duo of Ryom Tae-Ok and Kim Ju-Sik qualify for a spot in PyeongChang, but its national skating body missed an Oct. 30 deadline to submit their entry for the Olympics. North Korea also had an outside chance at qualifying in short track speed skating but skipped the final qualifying competition, held in Seoul last month. North Korea can still send athletes to select events if the International Olympic Committee (IOC) grants the country some wild card spots. Lee also mentioned women’s hockey as a potential event for North Korea. Pyongyang may assess that its participation is an act to “help” the South, according to a report by the South’s state-run Institute for National Security Strategy (INSS). “In exchange for that, it cannot be ruled out that it would demand Seoul lift economic sanctions against it and resume economic cooperative projects and humanitarian aid,” the report said. Seoul has imposed unilateral sanctions over the North’s nuclear and missile tests and also banned inter-Korean exchanges to punish the North for the sinking of a South Korean warship in 2010. The South also closed an inter-Korean industrial complex in the North’s border city of Kaesong in 2016. “The North is likely to give weight to participation (in the Winter Olympics), but it is expected to make a final decision in tandem with the South’s attitude,” INNS added. The report said that, at future talks with the South, the North could demand the suspension of military drills between the South and the U.S. as well as Washington’s stopping the regular deployment of its strategic assets on the Korean Peninsula. “Pyongyang could call for such conditions when it opens talks with Seoul over the Olympics, a move aimed at taking an upper hand in inter-Korean ties,” the INNS report said. The INNS said that the Kim Jong-Un regime will likely refrain from provocations at least until the opening of the Winter Games. “But it also cannot be ruled out that the North could resume provocative acts if Seoul and Washington resume their joint military drills after the games,” it said. The INNS added that Pyongyang could focus on putting nuclear weapons and missiles into operational deployment, rather that carrying out additional testing.